The construction cranes in Los Angeles are hard to overlook as several billion-dollar construction projects rise into the sky. But not everyone knows that this progress and the jobs that come with it are driven by overseas money. In fact, nobody knows how much foreign direct investment is coming into L.A. and the broader region, except for anecdotal evidence you can’t miss like the 70-story Wilshire Grand. 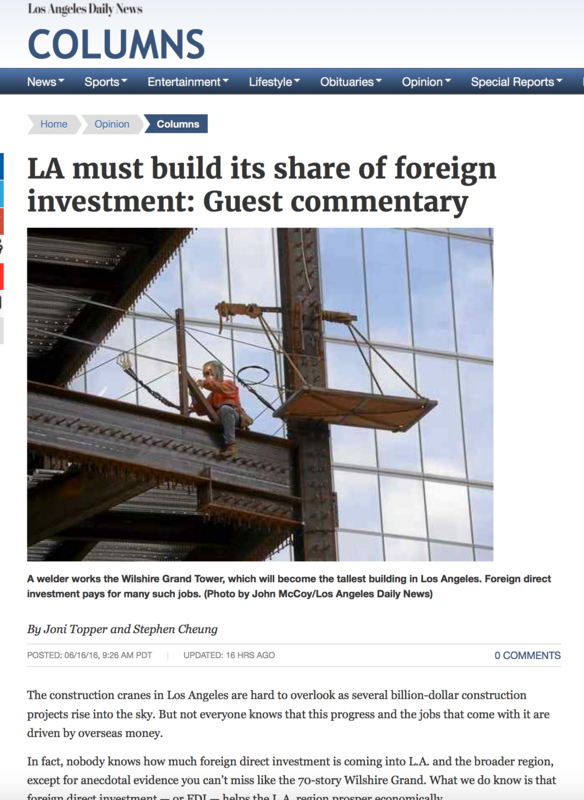 What we do know is that foreign direct investment — or FDI — helps the L.A. region prosper economically. For every visible project, there are thousands of small and medium-size businesses in L.A. that are here because of FDI, and those businesses create good jobs. But if we don’t recognize the importance of FDI, and don’t aggressively act to attract overseas investors, there are plenty of other cities in the nation and in the world that will take those jobs. Are we competing for the next investment? While anecdotal evidence suggests our region might be among the top recipients for FDI in the nation, we risk losing that economic engine unless we support organizations and efforts to tell L.A.’s story and meet with these investors to attract new projects and firms. • Support 5.6 million jobs in the United States. • Tend to be more concentrated in high-value, advanced industries, which are the jobs our community wants. • Account for 19 percent of all research and development in the U.S.
• Pay 22 percent higher wages than average. Now it’s time to look more closely at the role of FDI in Los Angeles. What types of investment are shaping our economy, like affordable housing, hotels near our convention center, or infrastructure to make our region more resilient? How many jobs rely on this source of activity? The answers are coming as World Trade Center L.A. and the Los Angeles County Economic Development Corporation prepare to release the first FDI study for the region in nearly a decade. Good timing too, because foreign investors will be eyeing that report when they stop in L.A. for the upcoming SELECT LA Investment Summit on their way to Washington, D.C., where they will be hearing pitches from all the other cities and states in the nation. As Angelenos, we can’t rest our hats on one event. Thousands of jobs in our region require sustained efforts to remain a world leader in attracting foreign direct investment. Joni Topper is a managing director with JPMorgan Chase Los Angeles. Stephen Cheung is president of the World Trade Center Los Angeles. CEDA Board Meeting Conference Call Scheduled for Thursday, June 23, 2016 at 10:30am.